Everything the school is investing in with the campaign just seems to make sense. In the end, it will be seen as a short-term expense for a much more stable, long-term investment in curriculum and character education for the school. 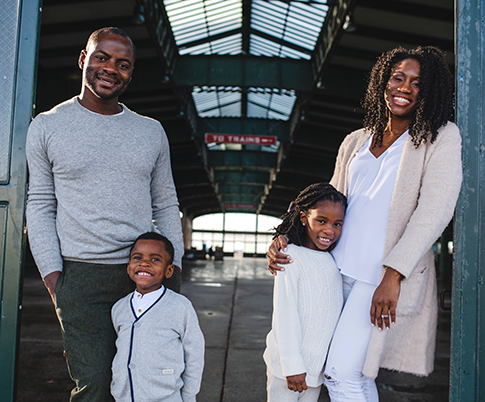 Levee and Nneka Brooks were diligent in their research as they investigated Kindergarten options for their oldest child Aria several years ago. They considered the public school system in the Montclair area where they lived. They contemplated the independent school options throughout the area. They even considered a move back to Manhattan to send Aria to a private school in the city. Then, something surprising happened that moved Peck to the top of their list. A sense of shared values and a belief in the power of education are both concepts that resonate deeply with the Brooks. Both Nneka and Levee came from families that prioritized values-based education. “Obviously, academics are important, but the main thing for us was to raise good kids who happen to be smart kids—not necessarily the other way around,” Brooks explained. Obviously, academics are important, but the main thing for us was to raise good kids who happen to be smart kids—not necessarily the other way around. The Peck Promise Campaign is a tapestry of those academic and character-based ideals. This summer, continued campus modifications will create a new Upper School STEAM (Science, Technology, Engineering, Art and Math) Wing in the Caspersen-Tomlinson building, as well as an expanded Lower School science lab to bolster an already-stellar academic program. With the beautiful new Peck Commons opening this fall, the family dining program will continue to bring community members together around a meal and conversation. A new InDeCoRe Lab in the same building will further support our award-winning character development program. The Brooks are proud to support The Peck Promise Campaign as it builds classroom spaces and community places that continue to foster the family values and community ties they cherish. But their financial support of this crucial endeavor was almost a foregone conclusion.